The oldest and simplest justification for government is as protector: protecting citizens from violence. Thomas Hobbes’ Leviathan describes a world of unrelenting insecurity without a government to provide the safety of law and order, protecting citizens from each other and from foreign foes. The horrors of little or no government to provide that function are on global display in the world’s many fragile states and essentially ungoverned regions. And indeed, when the chaos of war and disorder mounts too high, citizens will choose even despotic and fanatic governments, such as the Taliban and ISIS, over the depredations of warring bands. The idea of government as protector requires taxes to fund, train and equip an army and a police force; to build courts and jails; and to elect or appoint the officials to pass and implement the laws citizens must not break. Regarding foreign threats, government as protector requires the ability to meet and treat with other governments as well as to fight them. This minimalist view of government is clearly on display in the early days of the American Republic, comprised of the President, Congress, Supreme Court and departments of Treasury, War, State and Justice. The concept of government as provider comes next: government as provider of goods and services that individuals cannot provide individually for themselves. Government in this conception is the solution to collective action problems, the medium through which citizens create public goods that benefit everyone, but that are also subject to free-rider problems without some collective compulsion. The basic economic infrastructure of human connectivity falls into this category: the means of physical travel, such as roads, bridges and ports of all kinds, and increasingly the means of virtual travel, such as broadband. All of this infrastructure can be, and typically initially is, provided by private entrepreneurs who see an opportunity to build a road, say, and charge users a toll, but the capital necessary is so great and the public benefit so obvious that ultimately the government takes over. A more expansive concept of government as provider is the social welfare state: government can cushion the inability of citizens to provide for themselves, particularly in the vulnerable conditions of youth, old age, sickness, disability and unemployment due to economic forces beyond their control. As the welfare state has evolved, its critics have come to see it more as a protector from the harsh results of capitalism, or perhaps as a means of protecting the wealthy from the political rage of the dispossessed. At its best, however, it is providing an infrastructure of care to enable citizens to flourish socially and economically in the same way that an infrastructure of competition does. It provides a social security that enables citizens to create their own economic security. The future of government builds on these foundations of protecting and providing. Government will continue to protect citizens from violence and from the worst vicissitudes of life. Government will continue to provide public goods, at a level necessary to ensure a globally competitive economy and a well-functioning society. 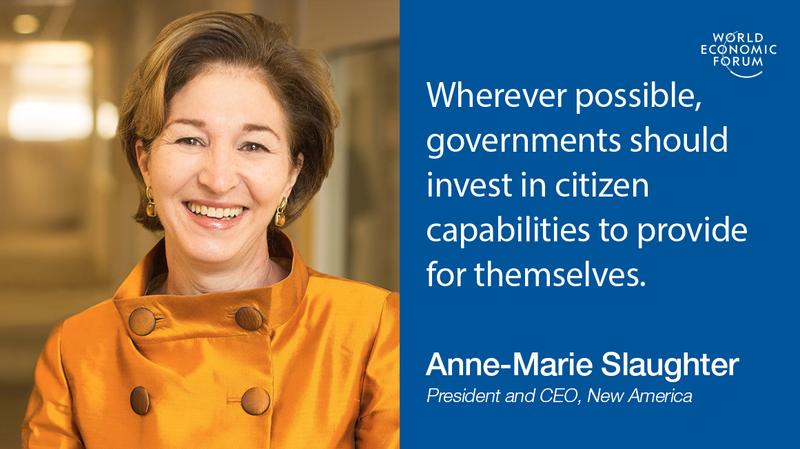 But wherever possible, government should invest in citizen capabilities to enable them to provide for themselves in rapidly and continually changing circumstances. This celebration of human capacity is a welcome antidote to widespread pessimism about the capacity of government to meet current national and global economic, security, demographic and environmental challenges. Put into practice, however, government as investor will mean more than simply funding schools and opening borders. If government is to assume that in the main citizens can solve themselves more efficiently and effectively than government can provide for them, it will have to invest not only in the cultivation of citizen capabilities, but also in the provision of the resources and infrastructure to allow citizens to succeed at scale. The most important priority of government as investor is indeed education, but education cradle-to-grave. The first five years are particularly essential, as the brain development in those years determines how well children will be able to learn and process what they learn for the rest of their lives. The government will thus have to invest in an entire infrastructure of child development from pregnancy through the beginning of formal schooling, including child nutrition and health, parenting classes, home visits and developmentally appropriate early education programmes. The teenage years are another period of brain development where special programmes, coaching and family support are likely to be needed. Investment in education will fall on barren ground if brains are not capable of receiving and absorbing it. Moreover, meaningful opportunities for continuing education must be available to citizens over the course of their lives, as jobs change rapidly and the acquisition of knowledge accelerates. Even well-educated citizens, however, cannot live up to their full potential as creative thinkers and makers unless they have resources to work with. Futurists and business consultants John Hagel III, John Seeley Brown and Lang Davison argue in The Power of Pull that successful enterprises no longer design a product according to abstract specifications and push it out to customers, but rather provide a platform where individuals can find what they need and connect to whom they need to be successful. If government really wishes to invest in citizen talent, it will have to provide the same kind of “product” – platforms where citizens can shop intelligently and efficiently for everything from health insurance to educational opportunities to business licenses and potential business partners. Those platforms cannot simply be massive data dumps; they must be curated, designed and continually updated for a successful customer/citizens experience. Finally, government as investor will have to find a way to be anti-scale. The normal venture capitalist approach to investment is to expect nine ventures to fail and one to take off and scale up. For government, however, more small initiatives that engage more citizens productively and happily are better than a few large ones. Multiple family restaurants in multiple towns are better than a few large national chains. Woven all together, citizen-enterprise in every conceivable area can create a web of national economic enterprise and at least a good part of a social safety net. But government is likely to have to do the weaving. A government that believes in the talent and potential of its citizens and devote a large portion of its tax revenues to investing in its citizens to help them reach that potential is an attractive vision. It avoids the slowness and bureaucracy of direct government provision of services, although efficient government units can certainly compete. It recognizes that citizens are quicker and more creative at responding to change and coming up with new solutions. But government investment will have to recognize and address the changing needs of citizens over their entire lifetimes, provide platforms to help them get the resources and make the connections they need, and see a whole set of public goods created by the sum of their deliberately many parts.